Women's Gold Etched Silver Necklace : LOVE2HAVE in the UK! 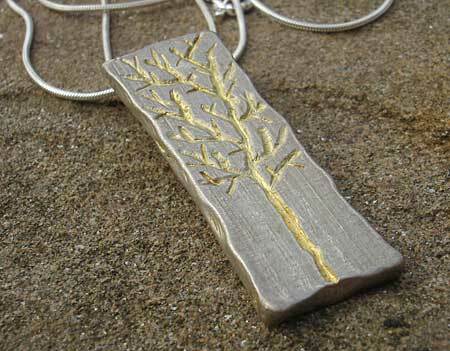 A women's gold etched silver necklace. This piece of jewellery is one of our more substantial necklaces for women. It is handmade from a solid slab of sterling silver that measures approximately 40mm x 12mm. The silver has a lovely uneven edging to it all the way around and a matt surface. 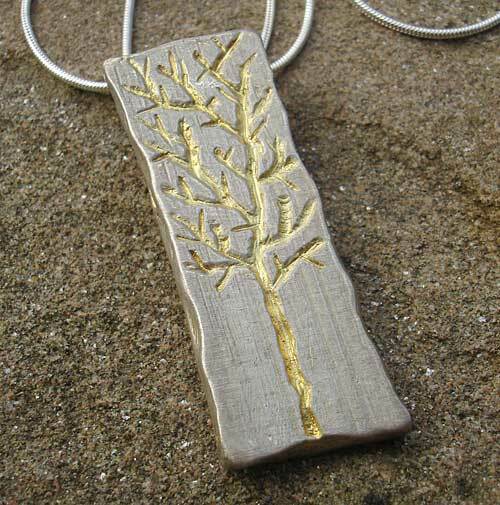 Etched on the front face is a tree shape that looks similar to a woodcut design. The etching is gold finished. The silver snake chain is 16 inches long as standard and comes threaded through an eyelet at the back of the pendant. Metal(s)/Material(s) Available: 925 sterling silver and gold.